Try this technique! Score very vanilla every .5 inches in each direction with the simply scored tool (small tip in the stylus). 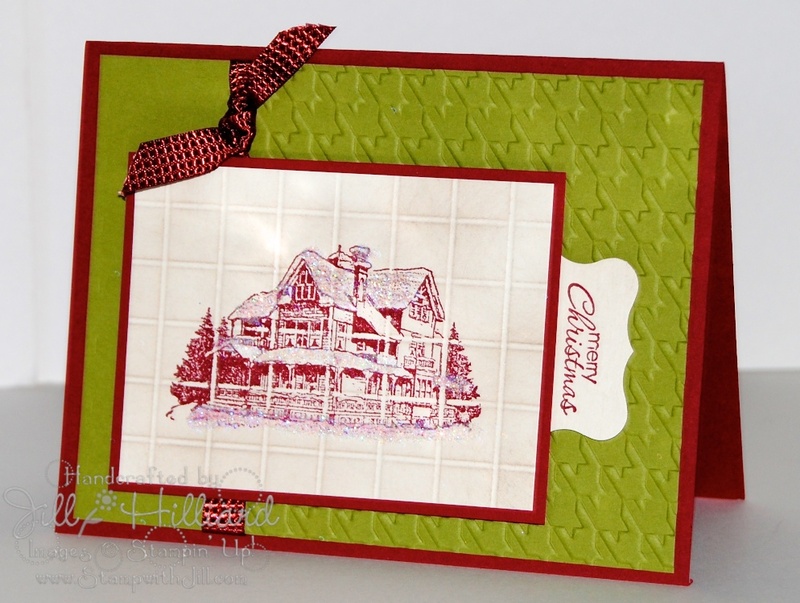 Stamp image, then lightly sponge in soft suede ink to make your score lines pop. then add glitter to the snow. Accessories: Quilted Ribbon in Cherry Cobbler, houndstooth embossing folder, curly label punch, Simply scored tool. Dazzling Diamonds glitter. 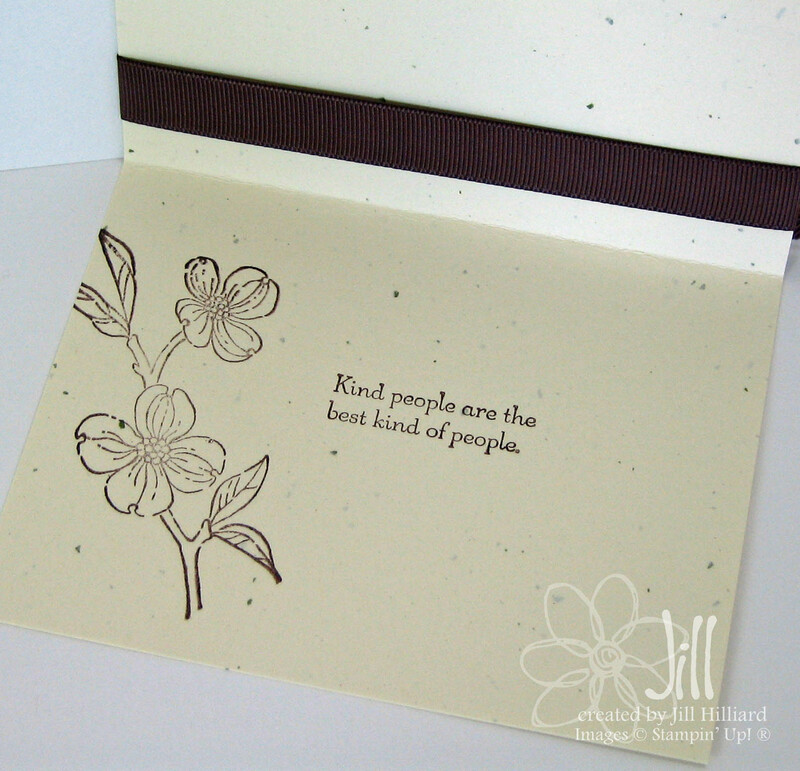 This weeks challenge: “Chipboard challenge” – use chipboard on a card or project. 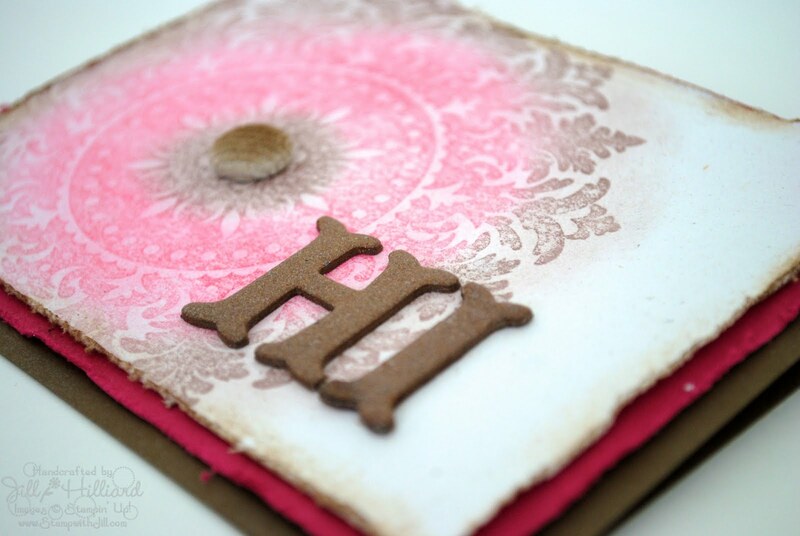 Well the new smooch spritz makes covering chipboard easy peasy! 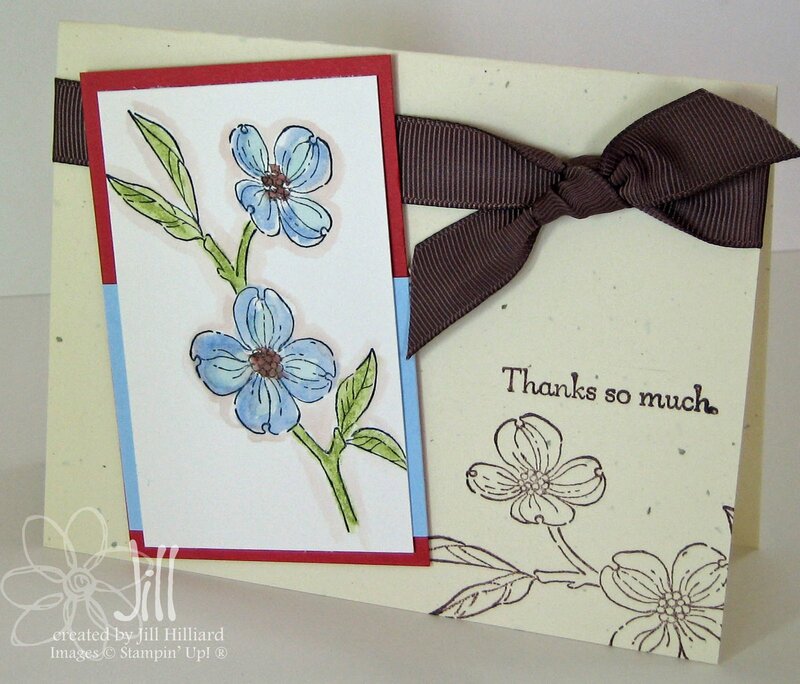 We made a version of this card at my friend Bridget’s workshop this weekend. we tried the technique Poppin’ Pastels! Every time I bring out my chalks I wonder why I don’t use them more! So here’s how its done: Stamp the medallion image in versamark ink. the using your sponge daubers apply the chalk in a circular motion to add the color to the image. it should pop right away! my chalk colors are chocolate chip & rose red. 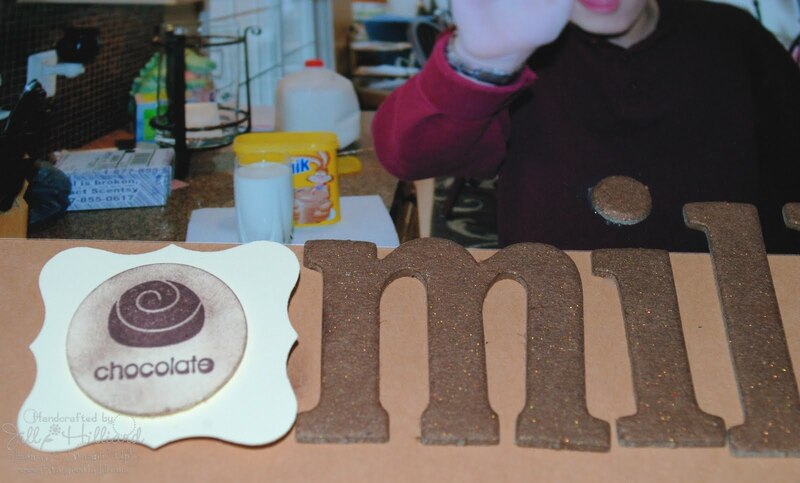 I used the Smooch spritz in log cabin to color my chipboard letters. then I smooched spritzed the whole card in Vanilla Shimmer to give it a whole lot more sparkle. you can see it in the 1st picture. I lightly sponged the kraft cord button in soft suede and distressed and sponged the edges, So Pretty in real life!!! 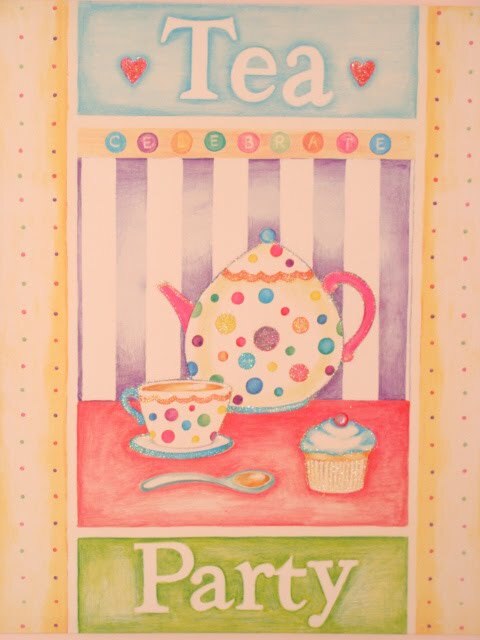 I think this is a close to “shabby” as I’ll ever be….have you seen some of the very cool shabby chic cards at the Shabby Tea Room?? Come and play! Accessories: chipboard, chalks, sponge daubers, smooch spritz in log cabin and Vanilla Shimmer, kraft coruroy button, distress tool. 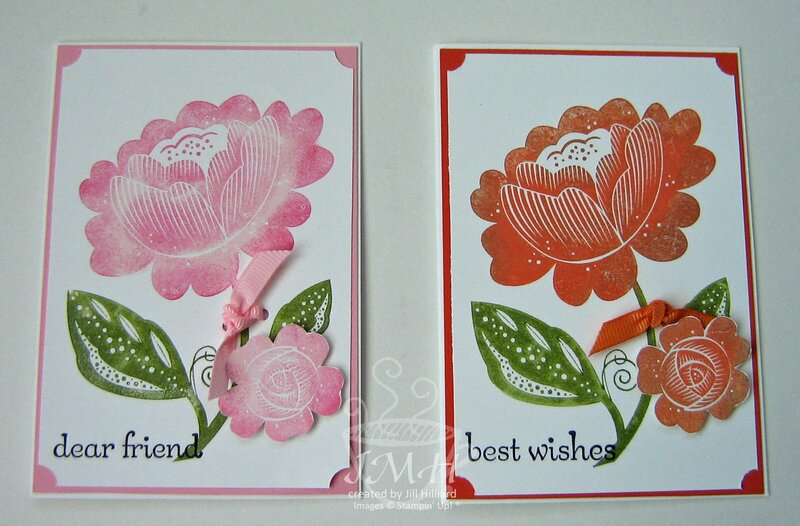 Here is a Sneak Peek at the New Smooch spritz Stampin Up! is offering in the new Summer Mini. I have never used these before now all I can say– WOW they take covering chipboard to a whole new level!! 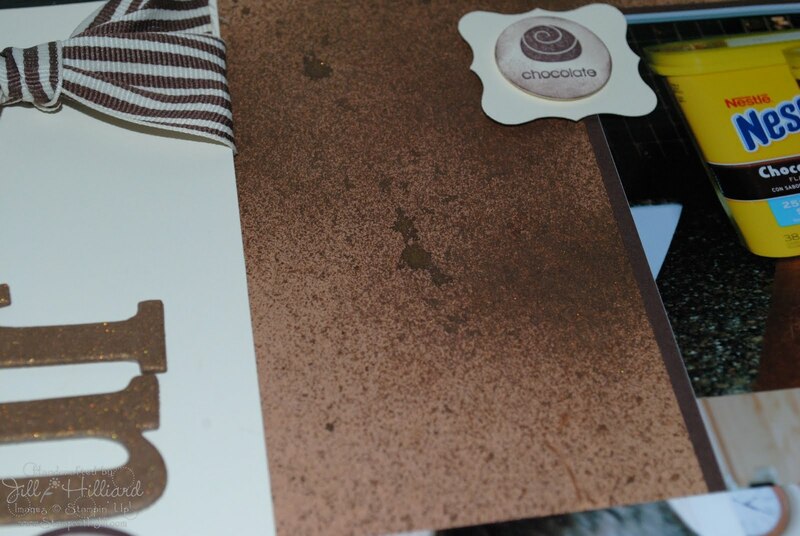 Take a closer look at the pictures– My son REALLY likes chocolate milk and he likes it really chocolate-y. So he skipped the spoon and poured. I’m not sure how I got this shot- I was in the kitchen just playing with the camera. He soon realized I was taking his picture. Hmmm, How much chocolate is too much??? I also sprayed it right on the card stock. My son constantly spills the Nesquick powder on the kitchen counter so I thought that it looked similar. Sparkle texture…LOVE IT!! On a side note, make sure you get the New Color Catcher. This Smooch stuff sprays all over! The color catcher is perfect for chipboard and cards, if you are spraying your 12×12 pages you will need to have a big box or go outside. I made a bit of a mess! Accessories: Smooch spritz in log cabin, chocolate chip striped grosgrain ribbon, chipboard letters, scallop border, curly label and 1″ circle puches. Here are 3 of the projects I made at the retreat. 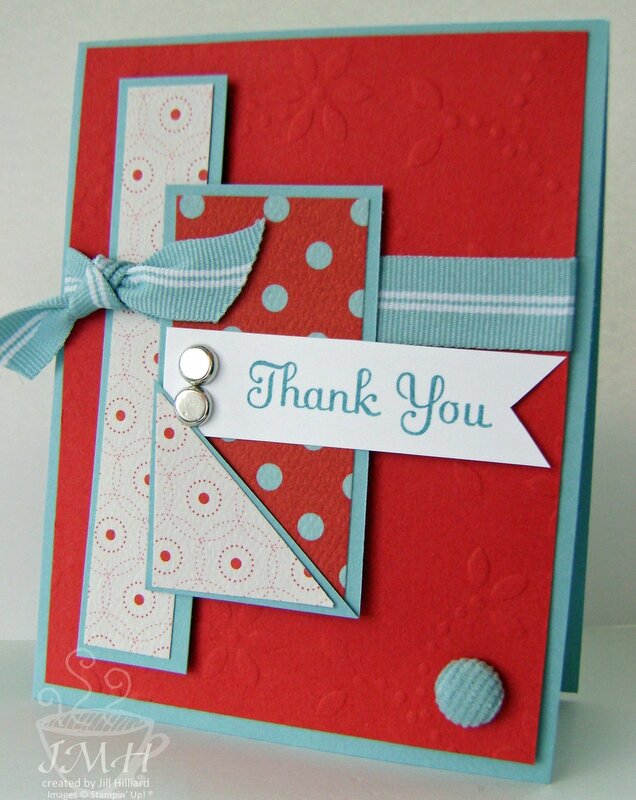 the Top left: this is made from the scallop bag die. 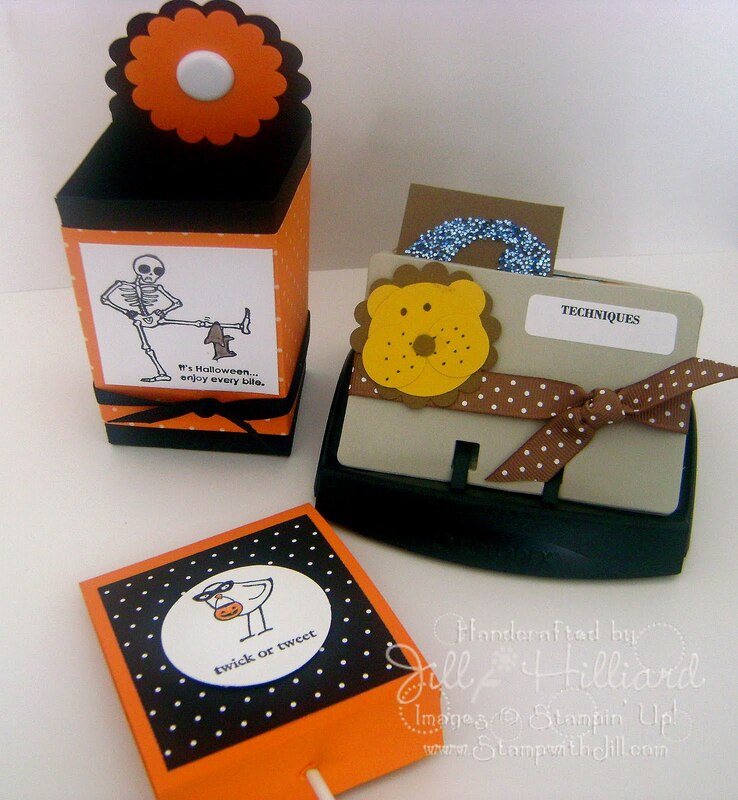 Rolodex was an optional add on- Its full of 11 different techniques. each one on a different card. more to come tomorrow and I finish up some of the details. Finally finished the last 2 cards of the OSW made from a 6×6 piece of paper. See THIS POST for the template and another version. Water colored with crayons on plain whisper white. I added a outline shadow so the white of the sheep would pop. 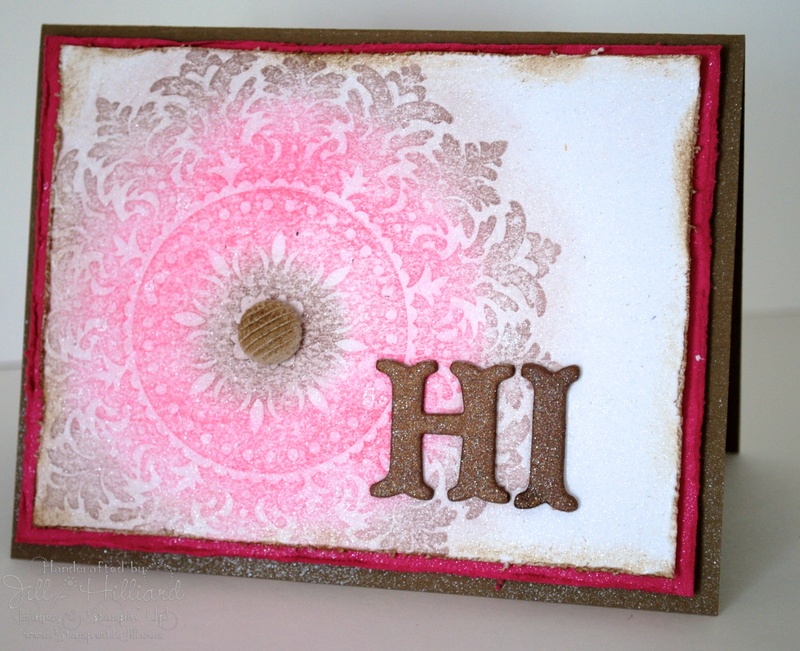 This is the Scallop Die (scallop circle #2) I punched the circle with the 1-3/4″ circle punch. ETA: the outline shadow is done with the water brush and a sahara sand watercolor crayon. Accessories: The big shot & scallop die#2, Paper piercer and mat pack, SAB ribbon bundle, silver brads, watercolor crayons & a water brush. Technique: water coloring. 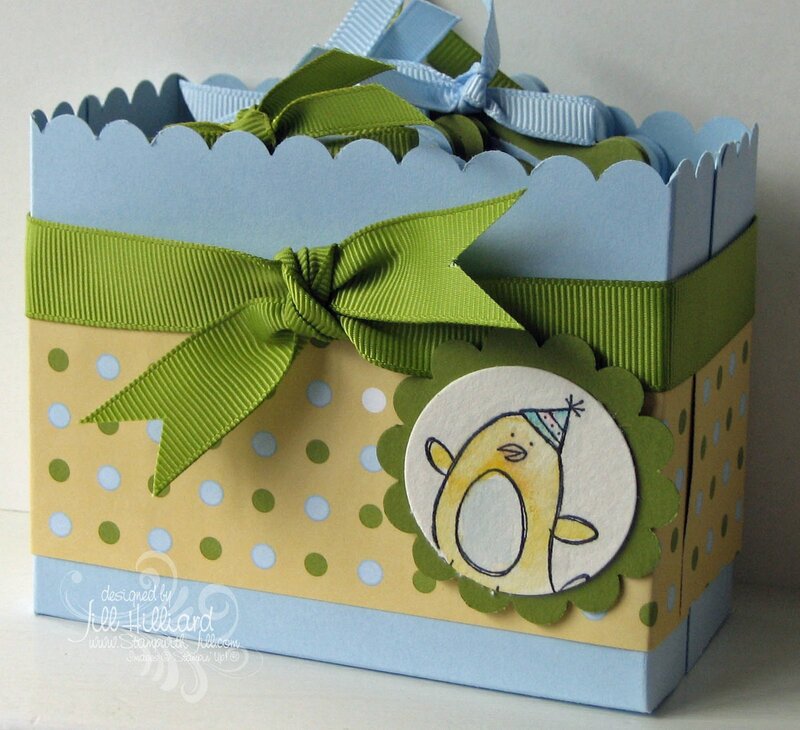 I made this box and note card set for my hostess last weekend. I die cut the scallop card with my bigshot. 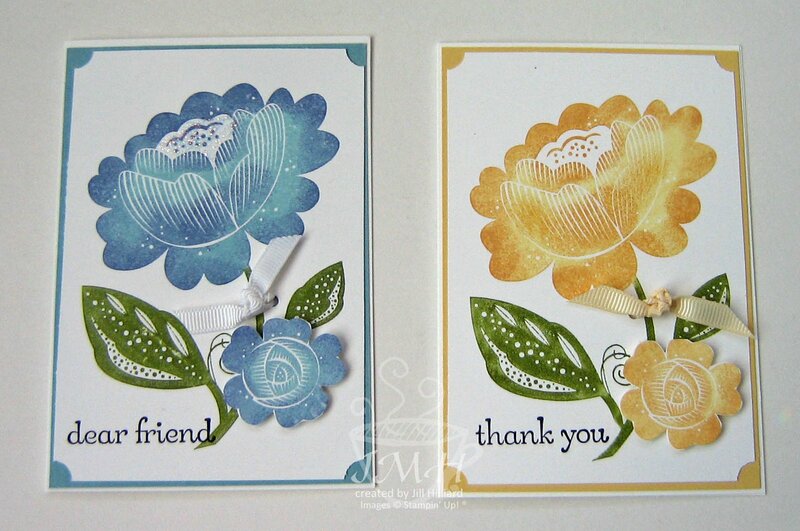 The bashful blue circles are cut with my coluzzle and then I punched watercolor paper with the 1-3/4″ circle punch. sorry, I forgot to write down the box dimensions….arrgghh! 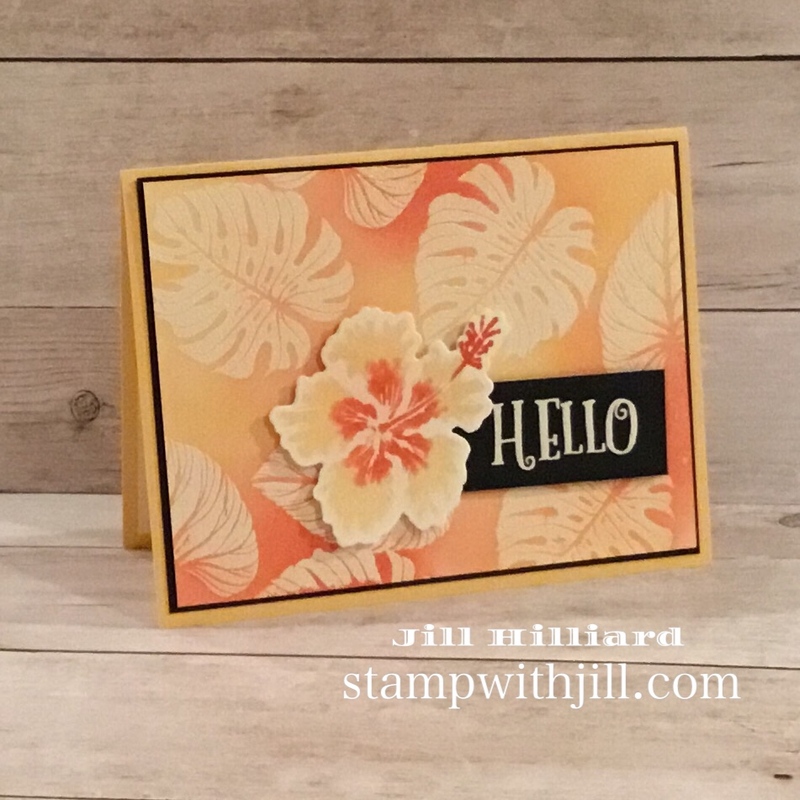 Accessories: water brush and water color crayons (all color families), paper piercer, word window punch, big shot, 1-3/4″ circle punch, scallop edge punch, old olive ribbon. Here was card from Regionals in Orlando. the Technique is water coloring. Here is how I changed it up, with the supplies provided and what was available on the table. 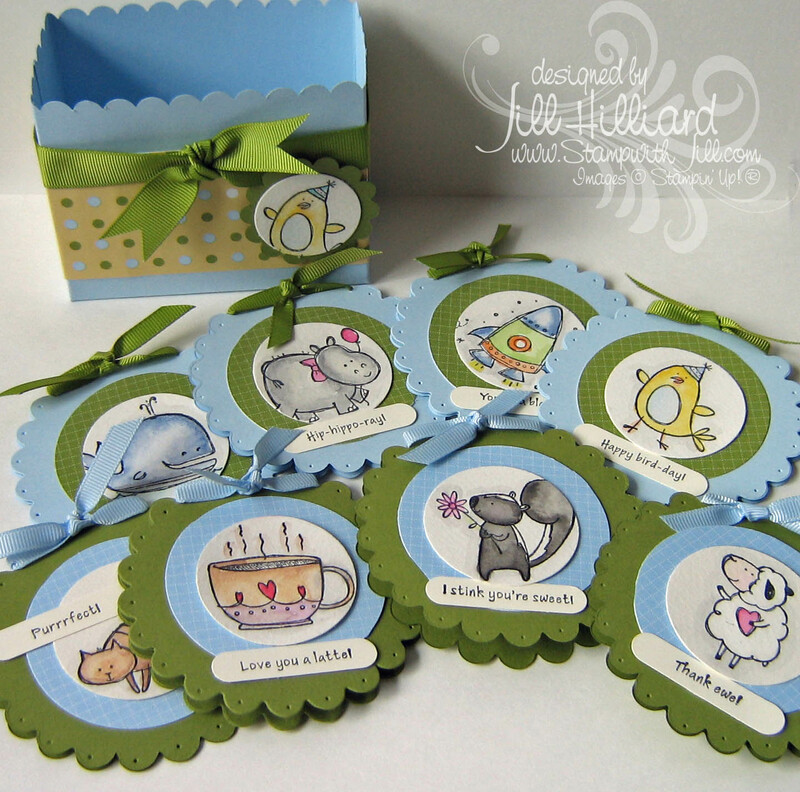 This set is new for the new Occasions mini coming in a about a month or so…. I think. Sorry I don’t know the name…..but its GREAT for water coloring. I outlined the whole image with a little bit if chocolate chip ink, really watered down, using the water brush. Can you see the dimension it gives? 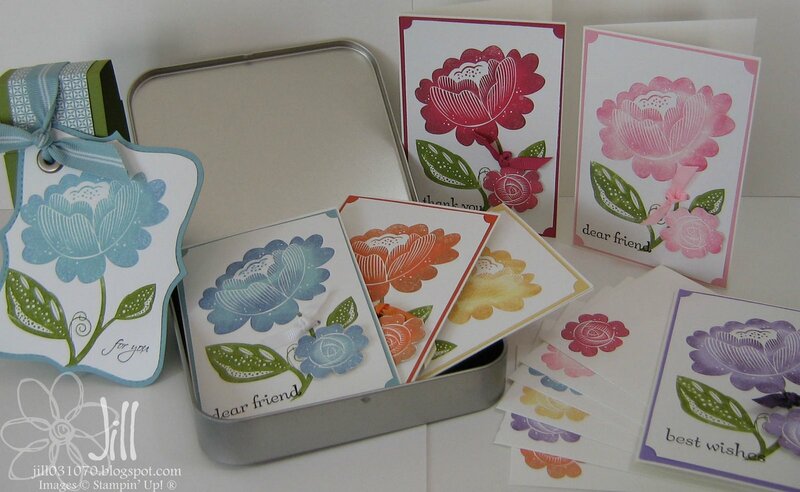 Accessories: Chocolate chip ribbon, water brush, water color crayons and ink for the lids of the stamp pads. 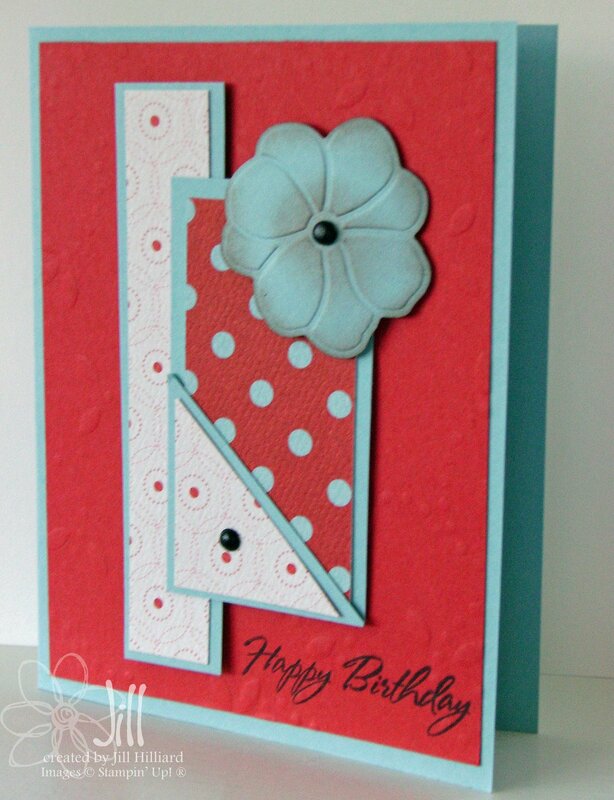 To see how I made these cards, check out my VERY 1st and VERY amateur video tutorial. Don’t mind my sarcasm (if you can catch it) and don’t mind the reversed images. I shot this 1st one from my laptop! I am not sure video is my cup of tea…..maybe with some practice! and a video camera would probably help. (I know I am my own WORST critic) Enjoy! 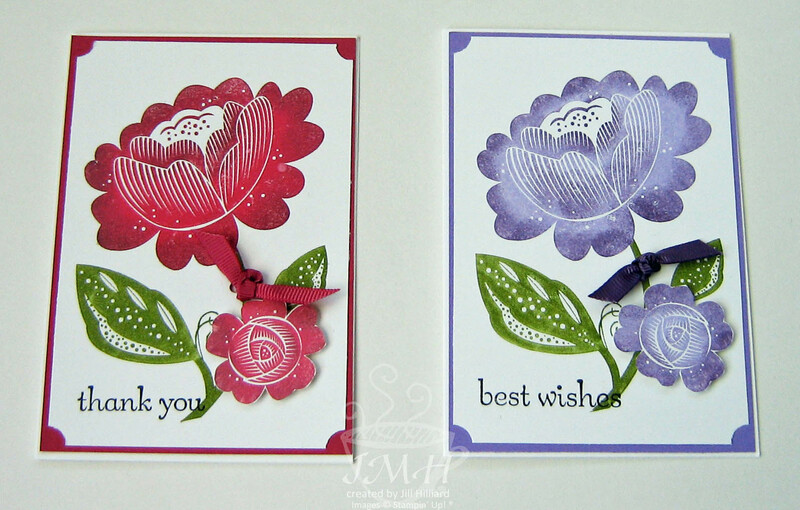 I stamped the small flower on the inside of the card and on the envelope using the same sponge dauber technique. We learned how to do this at Convention last July.